PHOTO BY NICOLE WALBY Sam Quinones is seen talking about his book, “Dreamland: The True Tale of America’s Opiate Epidemic,” Thursday night at the Marion Center located on the campus of TIffin University. The second annual Tiffin-Seneca Public Library Foundation Speakers series took place Thursday featuring an author who has explored America’s opiate epidemic. 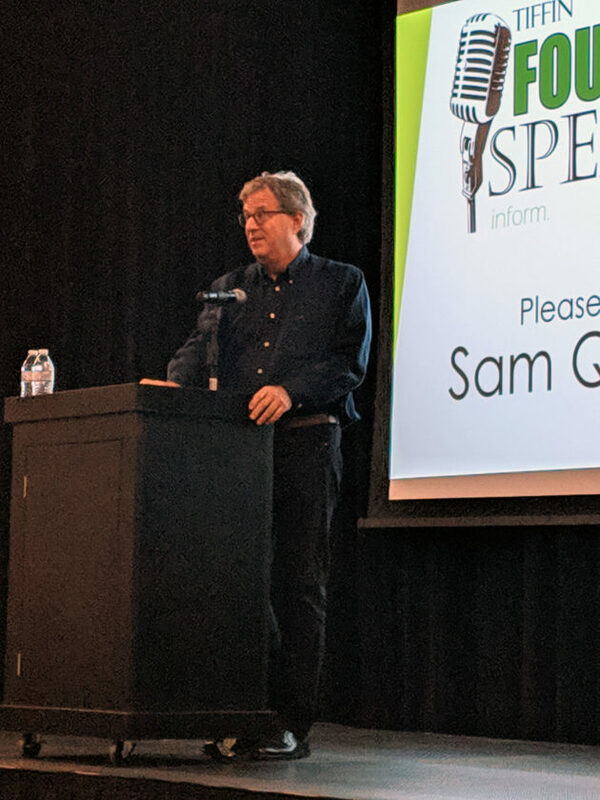 Sam Quinones is a freelance journalist and author who wrote the book “Dreamland: The True Tale of America’s Opiate Epidemic.” His book has been the featured topic during several library programs. During his talk, Quinones discussed several factors he has experienced while researching the opiate epidemic. Quinones said he has traveled to more than two dozen small towns in America. “It has been remarkable to see the country through this lens,” he said. Quinones said the opiate epidemic has been one of the deadliest, most profound drug surges that has touched all types of people. He said heroin entered the drug market in the 1980s, but at the time was expensive and often the drug was weak due to having changed hands so many times. Then Colombian drug cartels started transporting heroin and it became cheaper and more potent. Quinones said the real change happened in 1996 with the introduction of Oxycontin. In addition, the revolution of pain management was occurring and marketed drugs like Oxycontin as virtually non-addictive. Pills soon were too expensive to purchase outright and that was when the heroin market started to see an increase, he said. “We would not have had the problem with heroin we do today without Oxycontin,” Quinones said. Quinones said the issue with the need to numb the pain became who we are as Americans and as a country. “This destroyed the idea of community,” he said. Quinones said the only antidote to the opiate epidemic is community.